If you’re hunting for one that’s under $50, there are a ton of great options, but they are very different. Readers love the comfort of J.Crew Factory’s drapey pull-on (usually around $35 with the sale of the day), while Everlane’s work pant ($50) has a nice, crisp, hold-you-in feeling to the fabric. 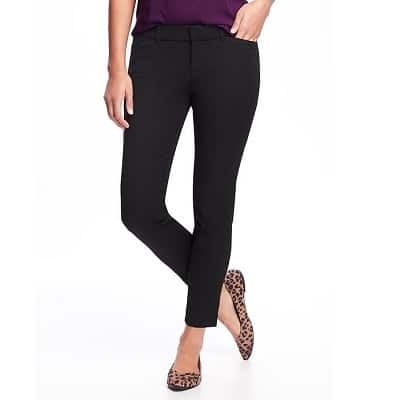 Still, if you’re looking for a ton of options in color and fabric sizes, readers swear by the Old Navy Pixie pants, pictured above — they’re around $35 and come in regular, tall, and petite sizes up to size 20; they’re also available in plus sizes. Another good option that’s often on sale: J.Crew’s Cameron pant, which readers recently noted was a good option for pears (and have pockets). 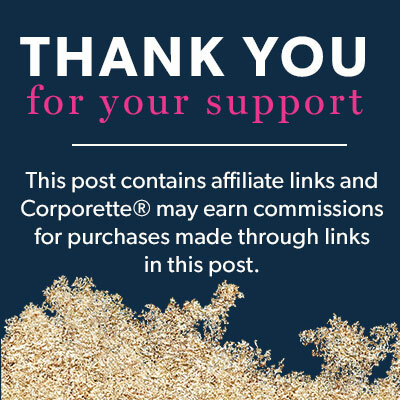 They’re available at Nordstrom and Net-a-Porter as well as J.Crew, although note that J.Crew has a ton more options and come in sizes up to 24, as well as petite and tall sizes. The pictured ones are a washable option good for four seasons! 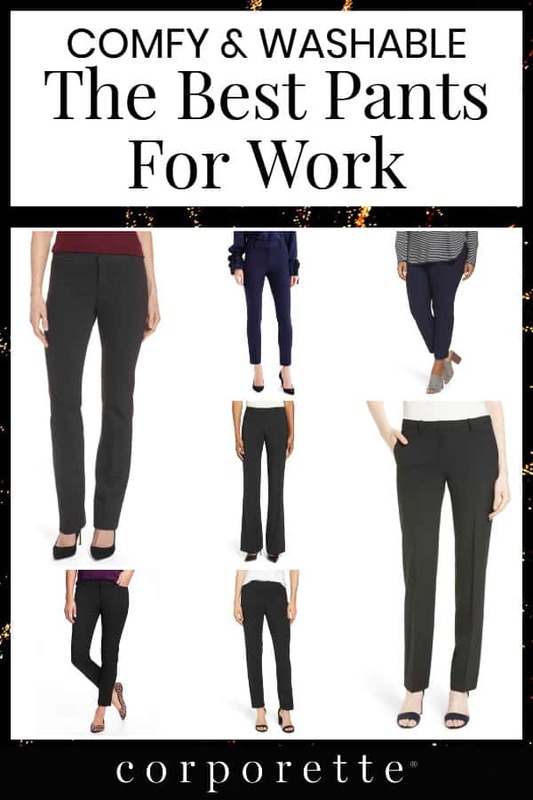 For just a bit more money puts you in the range of the NYDJ Stretch Knit Trousers, which are my personal favorite for a mix of comfort and polish — I feel more formal with the zipper (unlike some of the pull-on options on this list) and I feel like they wash and wear really well. I also like the thickness of the pants. They’re currently $78-$119; note that they’re almost always on sale in the big Nordstrom sales. A few other great options around this price point: Brass’s ponte pants are $98 (I’ve heard rave reviews but haven’t tried myself), as well as Nic+Zoe’s Wonderstretch pants (some options as low as $102, but mostly around $148). 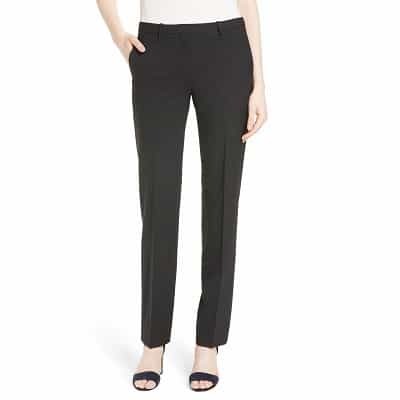 We’ve sung the praises of the pants the readers call “magic pants” before — they’ve noted that they’re “as comfortable as pajama pants,” “like slim cigarette pants that never wrinkle,” and “can be washed in a sink.” They come in plus and petite sizes, and a ton of colors — I personally haven’t seen anything but lucky sizes on sale but that’s me. They’re $168 new at Nordstrom, Dillards, Neiman Marcus and Bloomingdale’s. If washability isn’t high on your list of needs — or if you’re more looking for suiting separates that have great pants — Boss and Theory are the brands to beat. Boss’s slightly bootcut trousers get the highest ratings and are around $248, while Theory’s Good Wool trousers still get plenty of shoutouts. Fun fact: the Good Wool line is ” is spun from sustainably-farmed Australian wool milled at an environmentally-friendly factory” — and I was surprised to notice that Theory now goes up to a size 16. Social media images: Deposit Photo / LenblR. Readers, how about you — which do you think are the best pants for work? 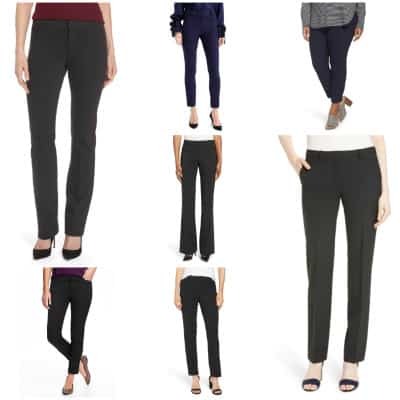 Which are your favorite styles to wear to work — drapey, slim knit, cropped, or bootcut/voluminous trousers? I haven’t been happy with any of the pants I’ve gotten at Old Navy. I’ve had lots of issues with fading and crease lines in their chino-type pants and unfortunate sagging after 2-3 washes with their more elastic pants. I can not wear pants at work, but concur with your view. The best place to buy pant’s was at Lord and Taylor, but they closed their flag ship location where I used to go for lunch. FOOEY! Same! The pixie pants from Old Navy were great…for about 2 wears. They fade and stretch out. For petites, Talbots has a surprising variety. They seem to be holding up well, all washable. They have great sales if you have Talbots credit card. 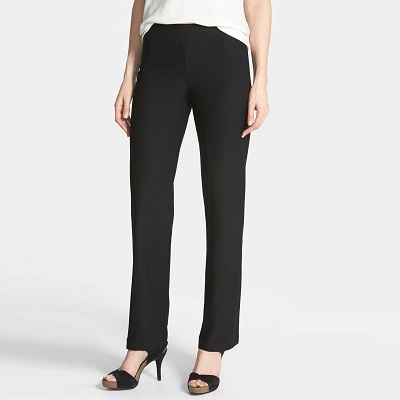 I like Ann Taylor’s modern fit ankle pants in doublecloth. I have a straight figure, and these fit well. 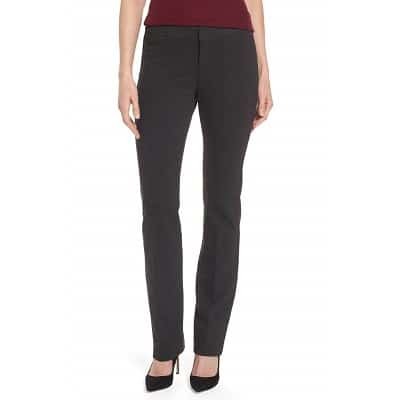 I also like Eileen Fisher’s system ankle pants–great material, indestructible. I shy away from the colors as they are a bit much for me. But the black and midnight (dark navy) are wardrobe workhorses. Incidentally, these basic colors never go on sale, but the colors do. I love my black Betabrand Dress Pant Yoga Pants when I’m locked in my office for 12+ hours. So chic and comfy and a staple for late nights, although I would change into seasonless wool for client meetings. I highly recommend Uniqlo EZY trousers, they’re decent quality, flattering and really comfortable. I got mine on sale for less than 20 bucks. Ann Taylor has some great pants. I miss their slim knit metro pants. I had a couple of pairs for eons until they stretched out. I will check out Everlane, thanks! White House Black Market has a lot of work pants but the quality is terrible. I bought two pairs in November and seams are splitting and major pilling already! What about Bodens pants? Any thoughts?